If your wife is Ukrainian, you will not have the traditional bachelor’s bread with peanut butter; you will have a really good restaurant at home, because Ukrainian women are some of the best cooks in the world! They are able to cook something delicious even from "nothing". But if a West Ukrainian woman arranges a special reception (Christmas, Easter, New Year, wedding, birthday, or simply just a meeting with friends or relatives), she could actually stay up all night before the event preparing for the festivity.It is a quote of one my stories I wrote about the incredible hospitality of Ukrainians. Now I would like to tell more, actually, about Ukrainian women and some their features. Also I want to say that I will tell mostly about West Ukrainian women. As I grew up in West Ukraine, I know very well the life there, also many experiences and stories from my family, friends and other people of whom I met during my work in journalism. When I was 16 years old, all my classmate girls from my high school already were thinking seriously about marriage. Yes, I am not joking. 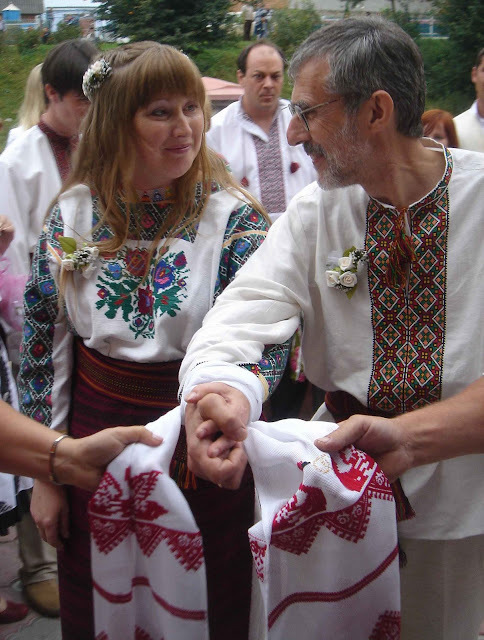 It is tradition in Ukraine, to get married at a very young age. This tradition is especially strong in the West Ukrainian villages. As I am a farm girl, I know it very well. I remember that even 20-year-old girls were called “old maids” in my village. I am silent about myself at what age I got married :). Actually, a lot of such 30-40 years old are now searching for husbands abroad because almost all the Ukrainian men are already married before the age of 30. Well, everybody has own choice. Perhaps, if I would think more about marriage when I was 16 years old, maybe, I already would be a grandmother, like many my classmates are now. But at my 16 years old I was thinking about studying in University, about future work in newspaper and I did not think how to bake a pie properly. I remember my classmate Lyuba telling me about her first cooking experience and how she burnt the pie. A young gentleman classmate overheard Lyuba and said "What? You are 16 years old, and you are not able to bake a pie?” Even at such a young age, it is expected by society to be proficient in cooking. So, this story can explain more why Ukrainian women become such good cooks. It is because in their 30’s, they already have had a big experience of cooking. OK, to know how to cook, it is just half of the story. The second half it is that all the good West Ukrainian mothers are to teach their daughters before their marriage, "When you are cooking for the family, remember: the best pieces of meal must be to your husband and children". It is not just truth, but historical truth. To give you an example, I will translate the words of one of the West Ukrainian folk song "Otkel Sonechko Shodilo" ("Where the Sun Came From"). This is a song from the Lemky, region in the western part of Ukraine, actually, now it is in the territory of Poland, where the Lemky ethnic group used to live. So, this song is about a girl who has an apple tree. She sings "My apple-tree, please grow up very high and a 100 branches wide, and give birth to an apple or two, one for my beloved, one for me. A nice big red apple for my beloved, and some little green ones for me". Well, but this is not the only Ukrainian folk song about this subject of devotion. Another very popular folk song in Ukraine is, "Porizala'm palchyk" ("I Cut My Finger"). So, here are some words of this song, "What a nice guy here? What is his name? I would like to marry him. I would not allow him to work; I would keep him just for the beauty". Dear guys, this is not just a song… it is the truth! A truth of modern Ukrainian life, in spite of fact, that this folk song was created several centuries ago! Many West Ukrainian women are holding their husbands just for beauty! Or just for "having a husband". To be married, a woman in Ukraine has a higher social status. Unmarried woman (single or divorced, but especially "old maidens") don't have such respect in Ukrainian society like married woman. I remember words of my auntie, when my cousin Halya got married at 20 years old (in eyes of the village's people she was "old maiden"). So, my auntie said about Halya, "It does not matter, how she will live with her husband, good or bad. The main thing, people will respect her and nobody will count her years". Wow, what a wild customs in this country, maybe, somebody will say! The aunt doesn’t think about happiness for her niece, just about that people will not count the years of an unmarried girl! No, I don't think that my auntie did not want happiness for Halya. Simply our aunt was under very big influence of local traditions and customs. Even under historical influence. It is a sad truth, but Ukraine lost a lot of men in the wars of last centuries. And every man (even not very good) has a big respect and big value in eyes of Ukrainian woman. Well, just look at the statistic. The population of Ukraine is 46 millions people. 53.7% of them are women, 46.3% are men. So, 7.4% of Ukrainian women destined to be alone all their life. By the way, I was one of these 7.4% still unmarried in 2006. Now I am a happy woman, not only because I am finally married, but also because I am very much in love with my husband. Fortunately, he is from a country, where the proportion of population is opposite that of Ukrainian. Thank God, we live in epoch of Internet, so, to find a soul mate now is not big problem. A person just needs to know where to look for a reliable source of information. For example, my husband and I met through Elena’s Models. The most reliable site I even seen (I tried few other before, but it did not work). And next big miracle of my life is that my husband is from a Ukrainian background (as many men are from his country)! Unbelievably! So we have a real Ukrainian family, with real Ukrainian customs and traditions in relations and everyday life. And when I am cooking, I really save best pieces of meal for my husband. It is because of my Ukrainian blood. And it is because several generations of my family taught their daughters to do it. And because I just love my husband. So simple reason to care about a person and to be devoted to!